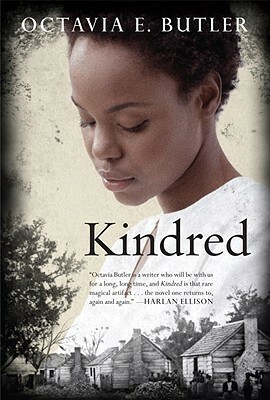 In this classic time-travel novel, a black woman is transported from the 1970s back to the antebellum South. Dana and Kevin are a mixed-race married couple living in Los Angeles. One day Dana is mysteriously transported back in time to a plantation in Maryland, seemingly brought back to save the life of a young white boy. That boy may be one of her ancestors, and he and Dana clearly have some sort of otherworldly connection. As she continues to be pulled back to him whenever he is in danger, she also gets to know him and is unsure whether or not he is worth saving. This is my final book for the Community Read nominations, though I hope to reread Americanah since it's been a while and I want it to be fresh in my mind when it comes time to vote. I've read one other book by Octavia Butler, The Parable of the Sower, which I liked ok enough. Kindred is better, though I still have a few problems with it. Part of it was just how time worked. There was a period in which one of them was stuck in the 18th century for 5 years, but only 8 days had passed in the current time. However, another time 6 years passed in the past while only about a day passed in the current period. I don't know if the time was intentionally screwy, but as a reader I found it confusing that there didn't seem to be a pattern. This is a compelling story that should be quite emotional, as this couple is separated and transported back and forth in time, and put in harrowing, and sometimes dangerous, circumstances. Although Butler does not hold back in portraying violence against the slaves, she shows too much restraint in her depiction of Dana and Kevin's relationship. There is a point when they are separated for five years (from Kevin's perspective anyhow) and when they are finally reunited, they spent little time talking about the experience. I mean, come on: five years is a long time. It merits several conversations over a series of days. But that leads to my other major problem, which is just that the characters weren't quite fleshed out enough. I realize that Octavia Butler writes science fiction, and character-driven novels aren't a hallmark of that genre, but I just felt like it could have been done better. We heard a little about Dana's background and motivations, but her personality was bland. Rufus was complex and I really liked how Butler portrayed him without making him two-dimensionally bad; it was necessary to understand why Dana continued to help him - but I still did not find him quite rounded out as a character. Although he was a pretty well crafted character, he still remained more character than person. But it was still a pretty good novel. Having Dana and Kevin be a mixed-race couple was a helpful choice plot-wise, especially when juxtaposed between mixed-race relationships back in the 19th century parts of the story. Interestingly, it occurred to me as I was reading that while her current-day life was considered to be very forward and comparatively free of racism, the 70s were still several decades ago and I can't imagine that mixed-race couples were always readily accepted even then. Life on the plantation was easy to visualize thanks to Butler's descriptions of the household; in fact I got much more out of these parts than Dana's 1970s life. That may be intentional though, as during the novel Dana and Kevin discuss how their lives in the historical era have come to feel more real than their "real" lives. Despite the time travel element, this story was pretty straight-forward and simple while still addressing complex issues. It would be a great book for a discussion group.